Christmas has come and gone, and I got all that I could hope for! For the most part, it was a great day with the kids and my wife, enjoying each others time on this planet together. We spent the afternoon/evening over at my in-laws house, feasting on Who-pudding and rare roast beast. 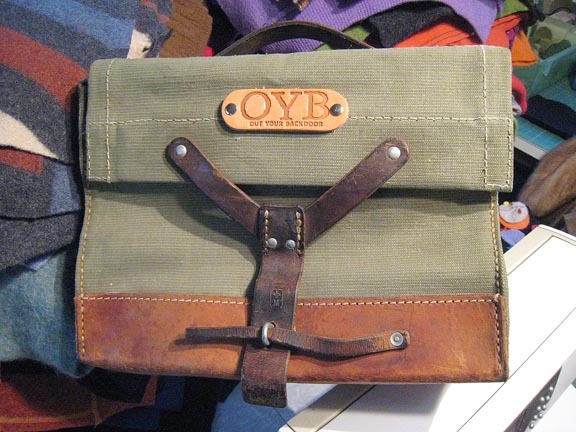 Before we left for the folks house though, I had a chance to quickly mount up the new OYB Pannier I received on one of my Twenties and snap a few photos. It turned out better than I expected! 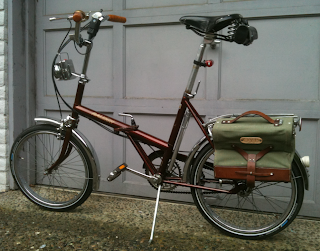 I had been looking for a set of small panniers for the Raleigh Twenty for quite a while. I generally use a rack mounted trunk when I commute, but it doesn't hold all that much and looks kind of goofy and "new." 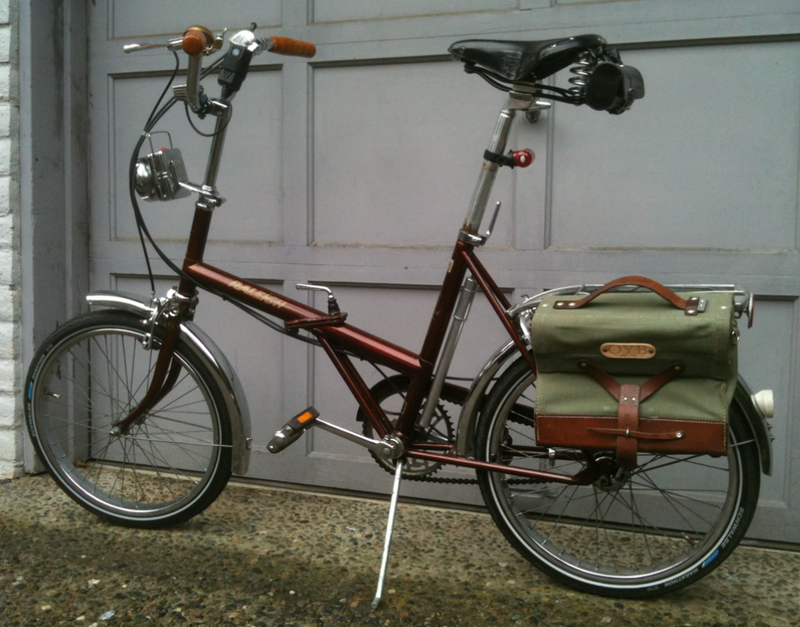 Most of the panniers I was finding looked too modern and were just too big. When I saw the OYB Panniers reviewed on Lovely Bicycle a while back, I put in my order for one. The overall effect, in my opinion, is spectacular. 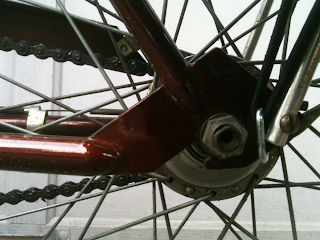 In terms of size, they are perfectly proportional to the size of the bike. The vintage look goes well with the time period of the Twenty too. And in the case of the brown colored frame, the leather trim matches perfectly. I tried it on the olive colored frame and it also blends well with the green canvas of the bag. Here is a closer look. 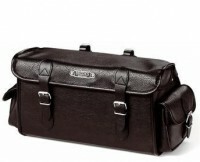 There is no internal reinforcement to keep the bag looking square when it is empty. Doesn't bother me. Once some stuff is in there, it should be fine. My number one worry when ordering this bag was whether the mounting hardware would fit a Pletscher rack. As you can see, it is perfect. 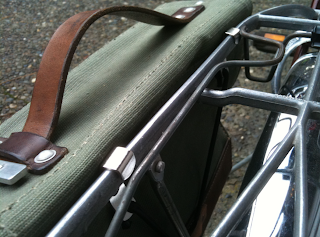 The rack mounts seem pretty rugged, but might be a little short. 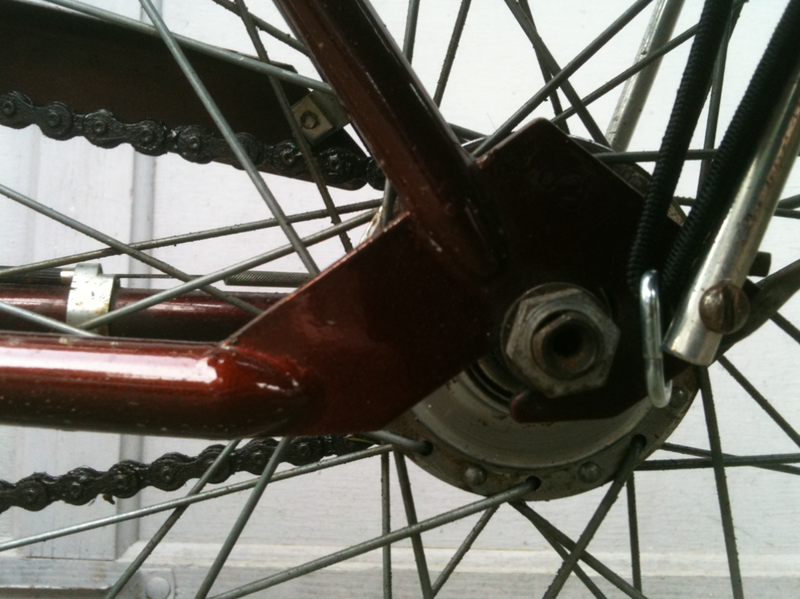 My only concern is that the bungee strap that connects to the frame below is strong enough to keep it mounted if you hit a significant road bump. We'll just have to see. My first couple times out, I'm only going to put clothing in it. You can see the shoulder strap in the bottom of the bag. So how big is it? Here is a picture of the pannier with my iPad in it. It fits PERFECTLY. This bag seems like it was made for the iPad. My iPad is 8" x 10" and I could probably slip 5 or 6 side by side in the bag. So there you have it. Based on what I saw, I immediately jumped on the OYB website and ordered up a second one. 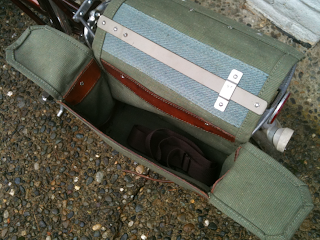 I like the more symettrical look of having a pannier on both sides. 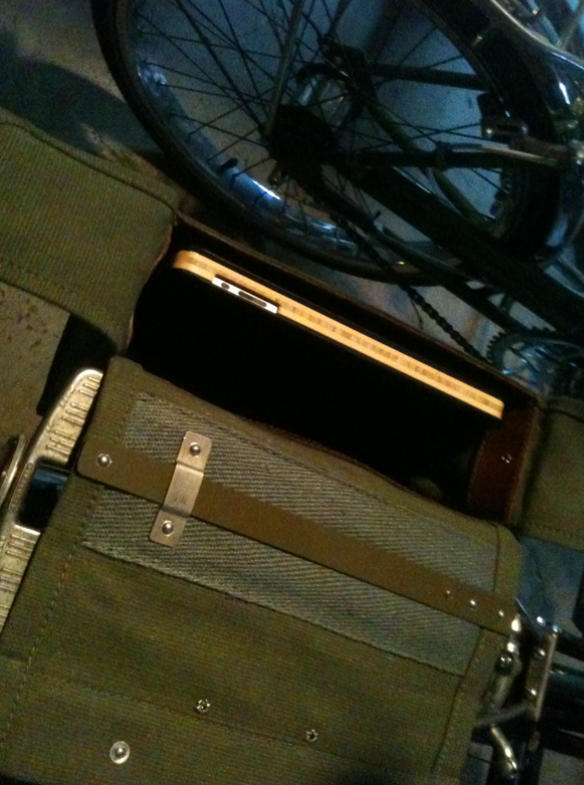 Besides, I can fit rain gear in one side and my "essentials" (iPad, journal, phone, etc..) in the other one. Overall, very happy with this bag! 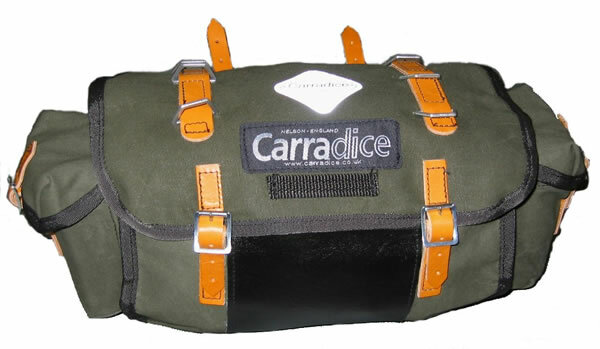 Response to Aarons question about the relative coloring of this bag to the Carradice Barley bag... Here is a photo of the two side-by-side. 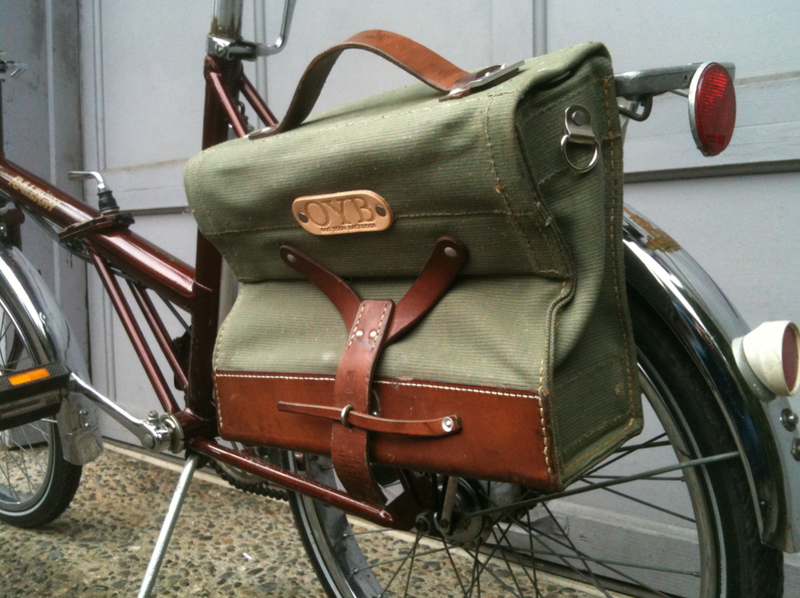 The OYB pannier is a bit lighter, and, to my eye, a bit bluer.